Lydia gazed absentmindedly outside the kitchen window, the bright June sunshine glinting off the dew-glazed sweet potato vine that cascaded from the window box just beyond the screen. It was barely seven-thirty, and fifteen-year-old Jack and eleven-year-old Amy were already on the bus, making the forty-minute ride to school. Their last day before summer vacation began. She’d have to make a special supper to celebrate the occasion. Waffles topped with strawberries and freshly whipped cream, lemonade garnished with mint snipped from the windowsill herb garden. Outside, Grey, their pewter-eyed silver Lab, began barking. A relaxed, friendly yapping. Lydia leaned in, scanning the yard for the source of Grey’s excitement. From her vantage, the farmyard was deserted. John’s truck was still gone and wouldn’t return until after six. The bedsheets that she had forgotten on the clothesline overnight flapped languidly in the mild morning breeze. The gravel road that wound its way up to the main highway was empty, no telltale dust announcing the arrival of a visitor. Someone could have come by way of the old mud road, but few dared to, for fear their tires would become stuck in the mire brought along by the early-summer rain. Lydia cocked her ear toward the window; Grey’s barking was replaced by the impatient clucks from the henhouse, the Sussexes waiting for their breakfast. Lydia sighed. It had been a long, lonely winter and spring and she was finally beginning to feel better after weeks of nausea and dizziness and a fogginess she could not explain. She looked forward to the hot summer ahead, taking the kids to the swimming pool in town, going on picnics, spreading a blanket across the front lawn at dusk and staring up into the navy blue night pinpricked with stars. She turned from the window, mentally ticking off the items she would need to make the waffles: heavy cream, last summer’s strawberries stored in the cellar freezer. In her periphery a shadow slid darkly behind the sheets fluttering on the clothesline. She paused. Slowly she turned back toward the window, trying to make sense of what she had just seen out of the corner of her eye. The linens swirled lazily with the rising breeze. Nothing there. A trick of light. She moved toward the cellar with slow, determined strides and stopped in front of the closed door. Normally she avoided the dank, stale cellar and she reluctantly reached for the knob, briefly considering scrapping the dinner of waffles and frozen strawberries. There was leftover meat loaf and mashed potatoes in the refrigerator, a plate of brownies on the counter. Lydia laughed shakily, slightly embarrassed with her skittishness. She had lived on this farm for fifteen years and had never been afraid. Lonely, yes, but never frightened. With a deep breath she twisted the knob, her fingers fumbling for the light switch. A rush of musty air filled her nose. Over the years she tried to remove the damp, fetid smell by placing bowls of vinegar on the floor, sprinkling baking soda and mothballs into the corners and strategically placing the box fan as far as the extension cord could stretch in order to blow fresh air down from the top of the stairs. Nothing worked. The naked lightbulb above her head doing little to illuminate her way, Lydia carefully moved down the wooden steps, sliding her hand down the iron handrail. Shelves of small, neatly labeled jars of strawberry, rhubarb and raspberry jams and quart and gallon-size glass containers of sweet pickles and chutney preserves lined one wall. In the narrow space beneath the stairs was where they kept the twelve-cubic-foot Coldspot deep freezer. John had bought it for her on their seventh anniversary, and while not the most romantic of gifts, she had to admit it was helpful. Whenever she wanted a pound of ground hamburger or the Iowa chops that John liked, all she had to do was go down to the cellar and retrieve whatever she needed. With effort she lifted the heavy freezer lid and was met with a blast of cold air. Quickly riffling past the wax-paper-wrapped pork loins and the plastic bags filled with blanched kernels of sweet corn, Lydia plunged her hand into the depths of the freezer in search of what she was looking for: a quart-size package of sliced and sugared strawberries from last summer. The initial push was the slightest of shoves, a nudge, really. Tentative. Almost a caress. A bird, maybe. A wayward wren or sparrow flying down the chimney and into the house and in its frantic state its wings fluttering against her back. That had happened before, birds getting into the house. Jack and Amy would howl with glee at the bird swooping at their heads desperate to find its way back out into the open air. But a second blow followed immediately, striking her in the lower ribs. Her breath was knocked from her lungs and she scrambled to steady herself against the deep freeze. With difficulty she twisted around, needing to see, needing to know who wanted to hurt her. Oh, it’s you, was Lydia’s final thought before being struck in the temple, their eyes locking one last time. The call, like many of its kind, had come in the early hours of the morning, waking Jack and Sarah from a dead sleep. Jack’s hand had snaked from beneath the covers, fumbling for the phone. He grunted a sleepy hello, listened for a moment, then sat up suddenly alert. “Is it the girls?” Sarah asked as she turned on the bedside lamp. They had dropped the girls off at the University of Montana just a few weeks earlier and Sarah’s worst fear was receiving an early-morning call like this. Jack shook his head and Sarah breathed a sigh of relief. Now, as their airplane ascended into the blue Montana sky, Sarah settled into her seat and gazed down at the expansive landscape below. The mountains, tipped with white, seemed to burst from the trees, while rivers meandered across the earth and deep lakes glittered in the midmorning September sun. Though she had grown up in Larkspur, she never tired of its beauty and she hated leaving, even for just a short time. She and Jack hadn’t strayed from Montana in years, saw no need to travel to exotic lands, to ocean coasts or dry deserts. All they needed they found in their home on Larkspur Lake. She looked over at Jack, who was shifting in his seat trying to find a comfortable position for his long legs. The cross-hatched lines that rested at the corners of his eyes had become more pronounced overnight and two deep grooves above the bridge of his nose extended to his forehead like a ladder of worry. She had seen this same look on his face when the first of their twin daughters, Elizabeth, was born and had waited a full sixty seconds, an eternity, to take her first breath. Saw the same expression when their other daughter, Emma, took a nasty tumble from her bike and came to them crying, her elbow dangling helplessly at her side. She knew that look. Jack was scared. She wished there was something that she could say to ease his nerves, but Jack was a reserved man who kept his worries to himself. She reached for his hand and absentmindedly he fiddled with her wedding band, spinning it around and around her finger like a talisman. “When do you think we’ll get to Penny Gate?” Sarah asked. “Yeah, if Amy showed up at the house any later, I don’t know if she would still be alive.” Jack went silent then, as if lost in thought, focusing intently on the seat in front of him. Sarah could hear the worry in his voice. What would they find when they arrived in Penny Gate? Would his aunt be awake and grateful to see him or would she succumb to her injuries and not survive the night? “We’ll be there soon,” Sarah assured him. Jack rarely spoke of his life in Penny Gate, of the years before the accident that took the lives of both his parents. He kept those memories well-hidden, the only part of himself that was off-limits to Sarah. All she really knew was that on a rainy spring night the year Jack turned fifteen, his mother and father climbed into their rusty old pickup truck and Jack never saw either of them again. Jack had been her physical therapist, treating Sarah’s injured shoulder after her own car accident, and after twelve painful but productive rehab sessions he announced that he had done all he could for her, at least physical-therapy-wise, then promptly asked her out on a date. She remembered the night Jack told her about the accident as if it was burned in her memory. They had been dating for about a month and spent the weekend kayaking on Deer Lake, three hours north of Minneapolis. It was a warm summer night; the sun was beginning to set, a large gilded orb melting into the lake’s horizon. They were in no rush to return to shore and laid their paddles across their laps and drifted languidly across the water. Sarah, at the front of the kayak, gently waved away mosquitoes that hummed past her ear and asked Jack about the night his parents had died. She wasn’t sure why he chose that moment to answer; he had sidestepped her questions so many times before. Perhaps it was because in the rear of the kayak she couldn’t see his face. Perhaps it was the remote location; they hadn’t seen another boat in hours. The only sound was the gentle slap of water against the side of the kayak. Jack had breathed the details of the story in staccato, short-clipped phrases that seemed to punch the air from his chest: He was drinking again. I should have stopped her. Stopped him. The roads were wet. Jack’s breath came out in jagged chuffs and Sarah could tell that he was crying. Slowly, carefully, as one might to a skittish animal, she reached behind her and found Jack’s hand. A year later they were married, she quit her job as a reporter and they moved to Larkspur to begin a family. In the past twenty years Sarah had wanted to ask Jack so many questions. Not just about the accident and the years that followed, but about what his life was like before his parents died. Simple questions. Did he look more like his mother or his father? What books did she read to him before bedtime or did she call him by a pet name? Did his father teach him to bait a hook or skip rocks across a pond? But every time she broached the subject, Jack would find a way to avoid the conversation. He wouldn’t let her in. Jack released Sarah’s hand and ran his fingers through his gray-flecked hair, a nervous gesture that she knew he would repeat a hundred times before they landed. “I shouldn’t have waited so long to come back,” he murmured. Jack jiggled his leg up and down, striking the back of the seat with his knee. The man in front of him turned around and glowered with irritation. Jack didn’t notice. “I’m sure they understand,” Sarah said, laying a hand on his leg to still it. But she wondered if Jack’s aunt and uncle truly understood how the boy they took into their home could stay away for nearly two decades. “I should have called her back.” Jack’s voice caught and he cleared his throat. “It just slipped my mind and I knew she’d call again in a few days.” Jack’s aunt, without fail, called the house each Sunday evening to check in and catch up on the events of their week. But the previous Sunday they were out for a walk and had missed Julia’s call. She had left a message on their machine, but it was late when they returned home and Jack had forgotten to call back the following day. When they came home and listened to the message, Sarah had thought she detected a shakiness in Julia’s voice, a tremor that made her think of Parkinson’s. At the time she had dismissed it, but now she wondered if she should have said something to Jack. “Do you think that Julia sounded different the last few times she called?” Sarah asked, pulling her cardigan more tightly around herself to stave off the plane’s chilly temperature. “Sometimes I can still taste those strawberries.” Jack smiled sadly and Sarah squeezed his hand. He nodded tentatively, a ghost of a smile playing on his lips. “Everything seemed so simple then. Easier somehow.” Jack turned to the window then and looked out at the far-reaching landscape below. The world was endless from this vantage point, full of infinite wonder and possibility, and Jack drifted off in thought as he took in the view. “I remember on stormy summer nights,” he started, his voice tinged with sadness. “When the power would go out, my mom would scavenge through the cupboards and drawers looking for flashlights.” Sarah’s breath caught in her chest. Jack never spoke about his parents. Ever. Sarah wanted to press for more but she knew this fleeting moment of reminiscence was over. As the airplane carried them away from the life they made together she watched Jack doze. Behind his closed eyelids she knew that a thousand, secret memories drifted. She wanted him to let her in, to know that he was safe. Safe with her. Maybe she couldn’t erase all the sadness and bitterness he was carrying. But she could be there for him and help him through the pain. She let Jack rest until the pilot’s voice filled the airplane cabin announcing their impending arrival in Chicago. The fasten-seat-belt light blinked on, and she lightly nudged Jack awake. Down below, the blue expanse of Lake Michigan was edged by miles of skyscrapers. Each drop in altitude was jarring, and Sarah’s stomach churned. She reached for Jack’s hand and closed her eyes, squeezing his fingers tightly until finally the wheels touched the runway. They had only fifteen minutes to get to their gate in time to catch their connecting flight to the small airport near Penny Gate, and Sarah scurried to keep up with Jack’s long strides as they wove their way through crowds of travelers, her carry-on bag bumping along behind her. When they arrived at their gate, they joined the line of passengers to board their connecting flight. Jack quickly called Hal for an update on Julia’s condition. They were the last of the fifty passengers to board the full flight. Because of their late booking Sarah’s seat was three rows behind Jack and across the aisle. It was just a short thirty-minute flight to the small regional airport near Penny Gate, and as they got closer to their destination, Sarah watched from afar as Jack seemed to grow more and more restless. His foot tapped nervously and he kept checking his watch. Sarah knew that a million thoughts were banging around Jack’s head. He hadn’t seen his aunt and uncle in twenty years. How would they receive him? With open arms or cold reservation? Jack was returning to the town where he was born and raised but whose roads had taken his parents away from him. Anxiety seemed to radiate from his body and Sarah wanted to go to him, to reassure him that everything was going to be okay, and if it wasn’t she would be right there beside him. Sarah peered out the window as they descended. Jack was right. He had told her that Iowa had a beauty all its own and the landscape was a patchwork of verdant greens, golden yellows and rich browns. When they landed Jack waited for Sarah at the end of the jet bridge. “Are you okay?” Sarah asked with concern. His skin had taken on a sickly hue. “Just a little airsick,” Jack explained as they went in search of a rental car. The clear sky above them was quickly being replaced by a blanket of leaden clouds and a cold wind pressed at their backs, hurrying them along to the rental car. Jack loaded their bags in the trunk and then opened the passenger’s side door for Sarah. She smiled at the small act of chivalry. “The hospital is only about half an hour from here,” Jack explained as he drove out of the airport parking lot. Jack was silent as he wove his way through busy interstate traffic past an industrial area with tall sturdy buildings, smokestacks and train bridges. Gradually the landscaped shifted and factories were replaced with vast fields stretching majestically into the horizon. Farm buildings peppered the landscape: bullet-shaped silos that reached to the sky, barns painted a crisp white or deep crimson, some barely standing, weathered by years of rain, wind and snow. They passed half-harvested fields of alfalfa, striped gold and green, and acres of sun-bleached corn lying in wait for the following day’s harvest. Barbed wire pulled tautly across the wooden fence posts that lined the fields like jagged teeth. It was nearing seven o’clock and the sun was setting behind the sharp line of the horizon, creating a golden halo across the distant fields. A light rain speckled the windshield and Sarah flipped on the car’s heater. Though the speed limit was fifty-five, Jack was barely going forty. She watched him covertly from the corner of her eye. His hands gripped the steering wheel, his eyes staring intently ahead. She wondered if he was trying to delay his arrival at the hospital, reluctant to see his aunt so badly injured, or if he simply dreaded returning to his hometown where he faced such painful loss. The road followed the path of the Gray Fox River and curled through the countryside. Could this have been the highway his parents were driving on the night they died? Maybe one of the recently harvested cornfields was where their car had come to a final rest. Jack glanced down at the speedometer and pressed down on the gas. “No, sorry, I’m fine. Thanks for coming with me. Are you going to get behind on your column?” he asked. The ditches were lined with rosy thistle and spiky purple prairie clover. In the distance stood dozens of wind turbines, rows of towering structures that seemed to have sprouted incongruously from fields of alfalfa. Their blades were eerily still at the moment, waiting to capture the prairie wind as it swept by. “Not a bit,” Jack observed. The Sawyer County Hospital was just on the outskirts of Penny Gate, and as they pulled into the parking lot Sarah could see it was a small building constructed of dark-brown brick that looked nearly black beneath the ashen sky. Jack eased the car into a parking spot and pulled up on the handbrake. Sarah waited for him to open his door, but he just sat there, looking ahead. “It’s going to be okay,” she said, hoping to calm his nerves. They sat quietly for a moment and Sarah wondered what was going through his mind. Was it fear? Sadness? Regret? Probably a combination, she decided, then broke the silence. Jack took a breath and held it awhile before letting it out with a deep sigh. “I think so,” he said as he popped open the door and stepped out from the car. But Sarah wasn’t so sure she was ready herself. Sarah Quinlan’s husband, Jack, has been haunted for decades by the untimely death of his mother when he was just a teenager, her body found in the cellar of their family farm, the circumstances a mystery. The case rocked the small farm town of Penny Gate, Iowa, where Jack was raised, and for years Jack avoided returning home. But when his beloved aunt Julia is in an accident, hospitalized in a coma, Jack and Sarah are forced to confront the past that they have long evaded.Upon arriving in Penny Gate, Sarah and Jack are welcomed by the family Jack left behind all those years ago—barely a trace of the wounds that had once devastated them all. But as facts about Julia’s accident begin to surface, Sarah realizes that nothing about the Quinlans is what it seems. Caught in a flurry of unanswered questions, Sarah dives deep into the puzzling rabbit hole of Jack’s past. But the farther in she climbs, the harder it is for her to get out. And soon she is faced with a deadly truth she may not be prepared for. 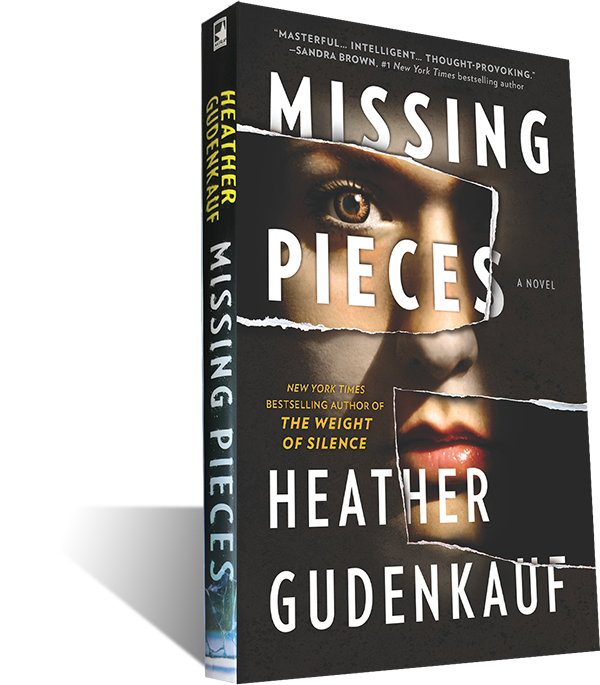 MISSING PIECES was selected as a February Indie Next Pick!